Representing over 6,100 full- and part-time graduate students at York University, the York University Graduate Students’ Association (YUGSA) is organized around principles of accessibility, social justice, and equity as it works to improve the learning, teaching, and working environments for all graduate students at York University. 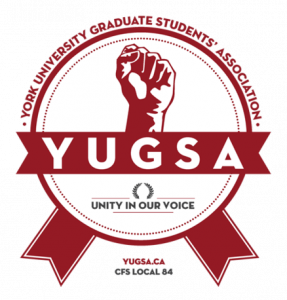 The YUGSA is dedicated to providing advocacy and support to all members across various graduate departments on this campus. As a student union, the YUGSA is committed to representing graduate students’ diverse interests and defending and advancing students’ and workers’ rights across and beyond York’s campuses. YUGSA has all kinds of supports in place for Graduate Students. For more information, visit York University Graduate Student's Association. 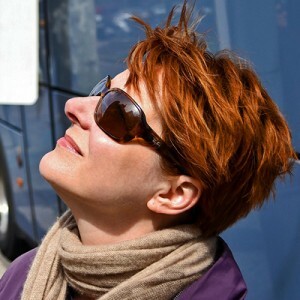 They also provide funding for conference travel, thesis costs and skill development. View the YUGSA funding page for further information and the deadline to apply for funds. Every September YUGSA registers Departmental Graduate Students' Associations (DGSAs) to which it provides an Operating Grant Fund (OGF), web services and more. DGSAs offer services back to their own department's members such as support for funding, academics, socials and events. Executives of DGSAs are elected by the graduate students of their own department and appoint representatives to take their voting seats at the YUGSA Council. Every year at the Full Time IS Orientation, a president elect is nominated and voted in. That person serves alongside the current ISGSA president. Below please find a message from the 2015-2016 President . We invite you to visit the YUGSA webpage to view what we do, who we are, and the campaigns and services offered. The ISGSA also applies for funding from YUGSA (through the Operational Grant Fund, our only source of funding) to enjoy social activities and promote educational experiences. We receive monies twice a year, with the amount dependent upon various factors such as how many registered graduate student associations there are in a particular academic year, how many students are enrolled in that department (pro rata basis), and whether registration has been continual over successive academic years. Your president, treasurer, and social convenor discuss opportunities for social and educational events throughout the year, and we will always send an email to our members asking for their input prior to scheduling an event. Again, this is YOUR student association and you have the right and responsibility of deciding when and where our funding is spent. We are a department that is wildly different than other departments in that our interests and courses may never converge with one another’s, therefore this year we have instituted a buddy system, pairing up first year students with second year students. This is a support system that we hope may help guide first year students through the maze of interim reports and thesis proposals, and get second year students out of their dark basements or small apartments as they are struggling with their thesis writing, and provide an opportunity to converse with human beings. So go email your buddy! If you have any questions about the ISGSA, or want to get ahold of any of us, below is our contact information. Looking forward to hearing from all of you! Good luck with your studies!